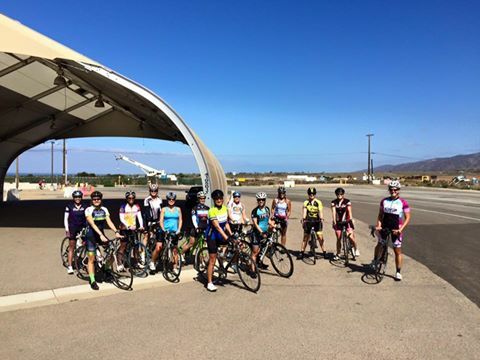 About 18 women gathered in Carlsbad last Saturday to enjoy some coastal riding. Kim Z. led three women in the C group on the coast south to Del Mar with a little exploration on the side to lengthen the ride, while Julie and I split the rest of the group between A and B groups heading north into Camp Pendleton. The A group maintained a hearty pace all the way to the end of the San Onofre Campground for a round trip distance of just shy of 52 miles. Our overall average speed ended up around 18mph, which is definitely on the top end of our rides. It was a strong day for Team Fun! The B group decided to turn around at the beginning of the campground parking lot, so we ended up crossing paths near Las Pulgas gate on the way back. Julie had the presence of mind to gather everyone together after showing IDs for a group shot – with a perfect blue sky, it turned out to be a good one. Janice, Shannon, Gina, Chin, Michelle, Sasha, Doreen, Suzanne, Lauren, Denise, Sabine, Jill and Heather. Tomorrow we have something totally different on tap, just in time for the heat and humidity! Fortunately we will be keeping it close to the coast (the entire ride is within the bounds of Carlsbad), unfortunately we will be heading up some hills! Jill and I tried out the ride yesterday, and I even managed to squeeze in some streets Jill had never been on… and that never happens. So come learn your next new favorite training hill tomorrow at 8am – meeting at the Ralph’s parking lot off Avenida Encinas in Carlsbad.